During the evenings and in the outer reaches of the Sunset, the ocean waves are dark and murky, the skies are cloudy and foreboding, and the sand dunes are whipped by intense gusts of wind. This isn’t the surfy California beach setting one might expect; this is San Francisco, and these are the City’s outerlands, where temperatures are cooler and weather patterns more intriguing than one might suspect. But in this hidden corner of the City, something is definitely afoot. A cluster of businesses have developed a surfer’s Mecca for those not easily dissuaded by distance and fog banks. And in the last year, David Muller and Lana Porcello (with an unnamed chef with a Range and Serpentine pedigree) opened Outerlands, which now provides a legitimate eating hub for the neighborhood. It’s fair to say Outerlands has become a favorite of many and a frequent spot for only a few (the distance, alas, does deter), but it’s worthy of high praise for atmosphere, taste, and vision alone. Serving lunch and dinner Tuesday through Saturday and brunch on weekends, Outerlands’ space is comprised of a lovely wall mosaic and tasteful interior touches that walk the line between Sea Ranch design elements and more current hippy surf-kitsch. And straddling that place between casual café and restaurant, the take on service is also casual: customers order their food at the bar, and lovely topper-stopped water bottles and hearty cutlery are set in a pile at one of the small scatterings of roughly-hewn wood tables. As with other restaurants, you get your bill at the end of the meal and you’re free to add a glass of wine or dessert or two as you go along. We initially became acquainted with Outerlands as a “soup place in the Sunset,” but it’s definitely much more. For instance, we recently enjoyed brunch, lunch, and late dinners. The menu changes often with each meal providing opportunities for a few soup-ish selections, a savory galette or soufflé of some kind, and a few lovely renditions of dishes that are complemented by Outerlands’ signature house-made levain bread. On one brunch visit, we tried a galette made with bacon and a whole egg ($8). The pastry crust of this savory, rustic tart was delightfully flakey and light, the ingredients fresh and seasonal, and the presentation — a big bright egg with lots of herbs — pleasing to the eye. We also enjoyed a sweet Dutch pancake served in a heavy caste-iron skillet and topped with toasty apples and a shake of cinnamon ($8), and a pot of organic Outerlands black tea ($4). For lunch or dinner, we’ve become big fans of the evolving seafood stew. Potentially the most expensive item on the menu, the stew includes a collection of colorful seasonal shellfish, fennel, and herbs, all served a lovely saffron broth ($14). 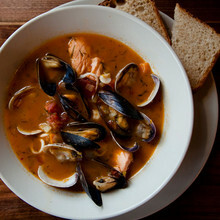 A more recent visit provided a less interesting, creamy bisque version with mussels and steamed salmon ($14 each). 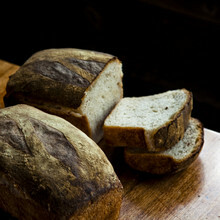 Of course, that lovely levain bread comes in handy when soaking up the broth of either ($3). The stew, the bow-tie mac and cheese ($6), the savory bread pudding made with roasted garlic, onions, oregano, and gruyere ($8), and the jumbo roasted artichoke or roasted asparagus with poached egg ($8 each) are go-tos at Outerlands. There’s also usually a meat dish of some kind on the menu — most recently, pulled beef cheeks and creamy grits ($12) — and a few vegetarian options, such as a heaping bowl of carrot soup with a drizzle of balsamic ($7). Desserts change daily but are typically seasonal and baked in house; recently we tried a somewhat crumbling flourless chocolate cake that was served with a surprise of pink peppercorns ($6). On each visit we couldn’t get enough of the levain bread. We learned that owner David Muller developed his own starter yeast over the past year and this is what gave the bread it’s unique, somewhat sourdough-like flavor. Served in large, Texas-toast-style wedges, and slightly seared on the grill, the bread — clearly a popular menu item — is now available for sale in jumbo old-school loaves ($5). Also worthy of a mention is the wine and beer selection — Muller and Porcello (who you’ll often find working at the counter) have a carefully chosen list of local and international wines that pair well with their seasonal menu. They also keep a few adventurous local brews on tap and some bottled beers, while providing patrons with interesting non-alcoholic options, like their spicy hot ginger lemon apple cider ($4). Let’s be honest, Outerlands is not convenient, nor is it always comfortable. 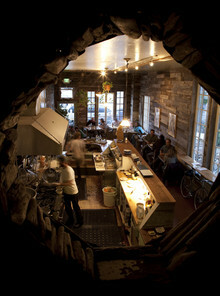 Seating is sparse, and the door is often ajar. Given the weather in this neighborhood, the interior tends to get cold. Nevertheless, Outerlands is quintessentially Californian — mellow and sometimes a little spacey, with some menu items that arrive quickly at your table and others that sell out just as quick, and usually without warning. Like the tides that come in and out at Ocean Beach, San Francisco’s ephemeral summers, and the hidden surf culture that lay ghost-like out near the dunes, an evening at Outerlands is unpredictable, but beguiling nonetheless.